Plaster column with fluted pillar of 25 cm in diameter with small Ionic capital and classical pedestal. Plaster column with fluted pillar of 25 cm in diameter with Ionic capital and small classical pedestal. 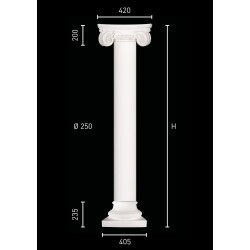 You can choose the precise height of your column ! The columns are used for the decoration of bays, arcades, entrance gate or to support various objects: statues, busts, glass or marble shelves. The columns are hollow, reinforced with vegetable fibers (staff) and can bear weight up to 70 kg per column! The columns are delivered assembled in two choices: either whole or in two halves. Choose the “two halves columns" option if you need to stand them against a wall or if you need to surround an existing pillar. Once reassembled, the half-columns have a large inside space. View the data sheet to check the free internal dimension of the column. For bays, we recommend to reduce the total height of the column (minus 1 cm) to facilitate the installation. 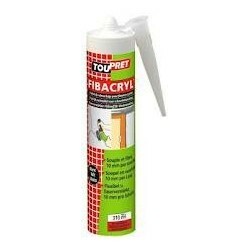 The columns can be fixed using adhesive plaster or assembly adhesive. The column must be painted. Preferably use an acrylic wall paint.